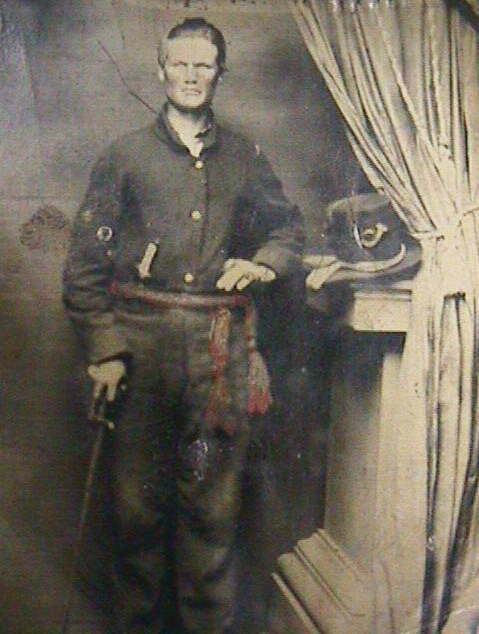 Before the Civil War, Lemuel worked as a farm hand and a boat hand on the Erie Canal. When the call for arms went out in April of 1861, the volunteers from the Syracuse area gathered and were formed into companies of volunteers. They were then sent to Elmira, probably by railroad, where they were mustered into service as the 12th New York on the 13th of May 1861. From Elmira they were sent south to Washington DC. When Lemuel enlisted in the spring of 1861 the boys of New York gathered in their civilian clothing and waited for several weeks for the Brooks Brothers Company to complete a contract with the state of New York to produce 12,000 uniforms. War material was in short supply at this time and all the states, both north and south, did all they could to uniform and arm their men. Brooks Brothers ran out of blue uniform material about half way through the contract at which time they switched over to gray uniform material that was common with militia units at that time. It is known that the 12th New York, Lemuel's regiment, was one of the regiments that was issued the gray uniforms. It is believed that the uniform worn by Lemuel would have had straps on the shoulder and either six or nine small buttons down the front. On July 18th 1861, about 1:00 to 1:30 PM, Lemuel Ladd and the rest of the 12th NY Vol. Inf. advanced on the Confederate position along Bull Run at Blackburn's Ford, VA. They were on the east side of the Blackburn's Ford road which ran down through a ravine to Bull Run; the 1st Massachusetts Infantry was just to the right of the New Yorkers and on the other side of the ravine. The 12th New York entered the woods to their front and soon ran into Confederate infantry and artillery. At the conclusion of the battle, six members of the 12th New York were killed, two more mortally wounded and several wounded; Lemuel was listed with the Killed In Action making him one of the earliest casualties of the Civil War. Of the six who were killed (Ladd, Darling, Westgate, Murphy, Markham and Walter); Walter was probably buried with the members of the 1st Massachusetts as he was killed with their skirmishers. Out of the remaining five there is some evidence to indicate that one was buried on the 19th of July behind the Stone Church in Centreville; as to which one of the five it was, may never be known. The location of the rest is not known. The two who were mortally wounded died on the 20th of July and were probably buried behind the Stone Church. Lemuel was a member of the 12th New York Volunteer Infantry which had several of it's members killed and wounded by Confederate artillery. It is not known exactly how Lemuel died, only that he was listed as killed in action. Back in the early 1970s, one of the Confederate gun emplacements could still be seen where it had been dug into the hillside just above the ford. Modern highway construction took away this gun emplacement and the highway itself covers the ground over which the 12th NY advanced. On July 16, US General McDowell's untried army of 35,000 marched from the Washington defenses to battle CS General Beauregard's 21,000 men at the vital railroad junction at Manassas. Advancing southwest at a crawl through the July heat, McDowell reached Fairfax Court House on July 17 and tried to find a crossing of Bull Run so he could flank the Confederate army. Beauregard anticipated him and posted troops at seven crossings. On July 18 McDowell sent his vanguard under US Brigadier General Daniel Tyler southeast from Centreville to reconnoiter the stream at Blackburn's Ford. Instead, Tyler attacked the Confederates guarding the ford. The brigades of CS Brigadier General James Longstreet and CS Colonel Jubal A. Early repulsed US Colonel Israel B. Richardson's brigade. This reconnaissance-in-force before the main battle at Manassas ruled out a head-on attack along Bull Run. McDowell decided to try to outflank the Confederates by crossing the stream beyond their left flank. George W. Benjamin, Edward Blaney, Floyd H. Broughton, Charles W. Brown, George W. Button, William Caffrey, Robert Clemence, Francis M. Coan, Michael Conlan, William Davern, Hugh Davison, Patrick Dervin, Timothy Desmond, Francis Doyle, John Dwyre, James Feeney, William Fickland, Garett Fitzgerald, John Fitzgerald, Edmund Fitzmaurice, John Fox, Francis Gillespie, John Guidar, William Hallem, Thomas Hart, Patrick Hennesy, George Hoose, William Kennedy, Dennis Kennedy, Jeremiah Killbride, Lemuel Ladd, John Lewis, Maxwell McCallen, Samuel McCormick, Patrick McCue, John McDonnell, James McGough, John McGough, John McLoughlin, Hugh O'Brien, Edward O'Brien, Martin O'Brien, James O'Donnell, Patrick Parsons, Horace Pratt, Frederick Price, Patrick Quigley, John W. Randall, Patrick Ready, John Regan, John H. Roberts, Michael Slattery, George Slicer, Charles A. Stocking, William K. Thatcher, James Thompson, James Warn.